Just a few days ago, AMD’s Roy Taylor posted a teaser image on his twitter page which showed an upcoming processor announcement. HardwareCanucks confirms that the teaser was indicating the relaunch of AMD’s current flagship FX-9590 processor with liquid cooling system package. The FX-9590 processor which is based on the high-performance 32nm x86 Piledriver architecture was launched a year ago in June 2013. Back at that time, the processor became the first to achieve the 5 GHz core frequency as a standard operating clock speed however was met with criticism due to a price of $999 US and a 220W TDP for which the processor became unfit for regular air-cooled systems. In addition to that, the 5 GHz clock frequency although a huge figure in clocks still couldn’t out-perform the mid-range Ivy Bridge-E offering which offers more performance due to a better optimized architecture and process design (32nm vs 22nm). Featuring support on the AM3+ socketed motherboards which are specially designed to fit these 220W monsters, the FX-9590 processor packs 8 cores and 8 threads with 8 MB of L3 cache, core clock of 4.7 GHz and boost clock of 5.0 GHz. The processor packs a TDP of 220W which is higher then Intel’s first 8 core Haswell-E offering that will arrive in Q3 2014 with a TDP of 140W. 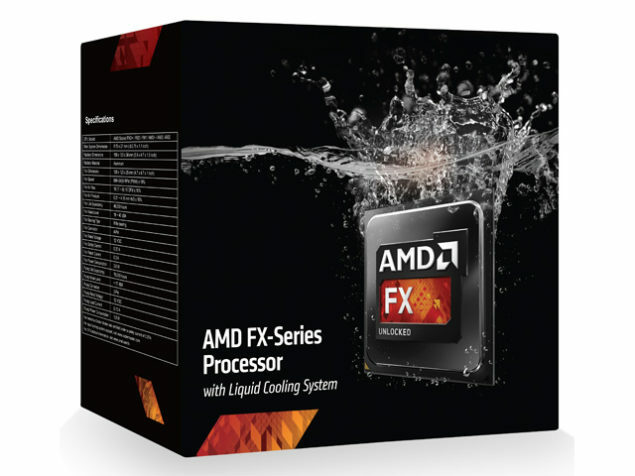 At launch, AMD launched the FX-9590 and aggressively pitted it against the Ivy Bridge-E lineup which it failed to match and cut it down to the $300 – $350 US range in the following months. The processor can be bought for $320 US on retail stores around the world while the $360 US boxed variant which is arriving soon will be optimized for enthusiasts at only $40 US more cost.